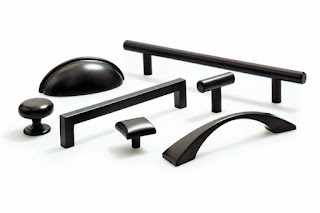 Hardware Resources' Matte Black finish is featured in 9 Jeffrey Alexander collections: Annadale, Bordeaux, Key West, Lenoir, Lyon, Merrick, Mirada, Sonoma, and Sutton. Elements collections with the Matte Black finish (pictured) include: Belfast, Edgefield, Florence, Glendale, Madison, Naples, Stanton and Verona. Jeffrey Alexander collections with the Satin Bronze finish include: Alvar, Belcastel 1, Bremen 1, Leyton, Lyon, Merrick, Sutton, and Tiffany. Elements collections with the Satin Bronze finish include: Florence, Glendale, and Madison. Jeffrey Alexander collections with the Brushed Gold finish include: Sutton and Tiffany.